From Putin, A New Tune On Ukraine? 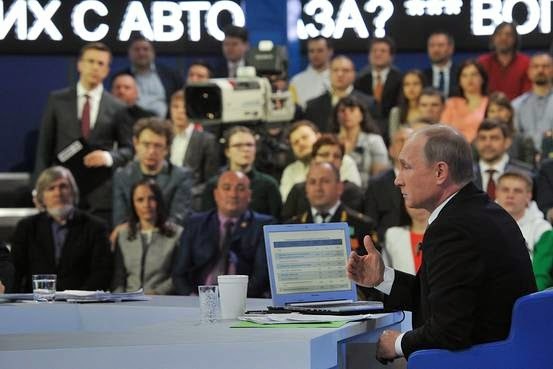 MOSCOW, Russia -- Vladimir Putin’s annual call-in show is not where I usually look for important statements of Russian policy. Russian President Vladimir Putin at his annual televised question-and-answer session in Moscow last week. Most of the four-hour event is devoted to semi-comical political pandering (Putin presenting himself as the friend of struggling dairy farmers, for example). Still, last week’s extravaganza contained unmistakable hints of a new line on Ukraine. To cope with Russian policy in this next phase, Western governments should be ready for a Putin who is more bored than bellicose toward Ukraine. * Moscow used to complain that former Ukrainian President Viktor Yanukovych was the innocent victim of neo-Nazi mobs in Kiev. On Thursday Putin explained his ouster differently. This sort of misrule always generates populist anger. It happened in Russia in the 1990s—and now, Putin said, it has happened in Ukraine. * Last year Putin rhapsodized about “Novorossiya” (“New Russia”), an 18th-century label implying territorial claims on much of Ukraine. With more trade, he implied, Russians everywhere will be better off. * Putin’s press secretary had hinted that his boss would say something about upgrading the status of separatist enclaves in eastern Ukraine. And he did: He seems to be against it. Having recognized Ukrainian independence in 1991, Putin said, Russia respects it now. * Finally, there was a calmer view of the Ukrainian government’s military action in the east. Separatists say that they are under constant threat, and Russian nationalists warn of spreading conflict. But when a woman from a refugee camp just over the Russian border complained of Ukrainian shelling, Putin reassured her. It surely wasn’t intentional, he said. No one should think Russian pressure on Ukraine is over, nor that Russian lying has ended. But Putin presents himself as someone more satisfied with the status quo, more ready to discourage new separatist offensives, more inclined to deflate Russia’s nationalist hysteria just a little. In its dealings with Western governments going forward, Russia’s line on Ukraine will be all practicality. Time to turn the page, to move on. Last year’s Vladimir Putin was an open disturber of the peace. The United States and its allies may find this year’s version more difficult to handle.